Contradictory forces are at play at the close of the twentieth century. There is a growing closeness of peoples fueled by old and new technologies of modern aviation, digital-based communications, new patterns of trade and commerce, and growing affluence of significant portions of the world's population. Television permits individuals around the world to learn about the cultures and lifestyles of peoples of physically distant lands. These developments give real meaning to the notion of a global village. Peoples of the world are growing closer in new and increasingly important ways. Nonetheless, there are disturbing signs of a growing awareness of ethnic differences in all parts of the world—the United States included—and a concomitant rise in ethnic-based conflicts, many of them extraordinarily violent in nature. Fear, resentment, intoler-ance, and mistreatment of the "other" abound in world news accounts. Not only does this phenomenon pose an interesting juxtaposition to the concept of the emergent glo-bal village, but its emergence in the post-cold war era internationally and the post-civil rights era in the United States raises significant and compelling questions. Why are such conflicts occurring now? How do analysts explain these developments? 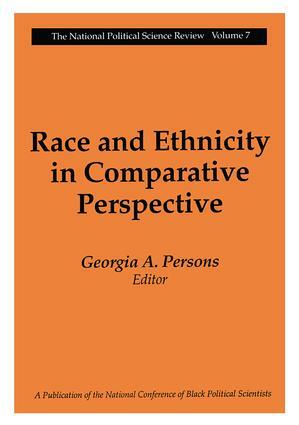 The essays in Race and Ethnicity in Comparative Perspective lucidly explore some of the complexities of the persistence and re-emergence of race and ethnicity as major lines of divisiveness around the world. Contributors analyze manifestations of race-based movements for political empowerment in Europe and Latin America as well as racial intolerance in these same settings. Attention is also given to the conceptual complexi-ties of multidimensional and shared cultural roots of the overlapping phenomena of ethnicity, nationalism, identity, and ideology. The book greatly informs discussions of race and ethnicity in the international context and provides an interesting perspective against which to view America's changing problem of race. Race and Ethnicity in Com-parative Perspective is a timely, thought-provoking volume that will be of immense value to ethnic studies specialists, African American studies scholars, political scientists, his-torians, and sociologists.